Well, the end is near for Season 6 of NBC’s The Voice. And, quite frankly, I did not envision this Top 3 – not at all. I am missing Sisaundra Lewis and Bria Kelly – two entirely different vocalists, but brilliant at their craft. So, it is safe to say that I am not particularly invested in this show this season and have no clear favorite for the win. 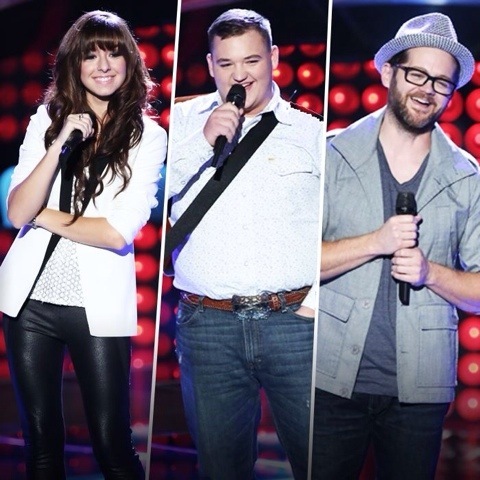 I wish all three singers the very best of luck. The Performance Show airs on Monday, May 19th at 8:00 PM, followed by the Results Show on Tuesday, May 20th at 8:00 PM on NBC. I say Christina is going to be crowned the voice for The Voice! DWTS…I am crossing toes and fingers for M&M to win!!! California Chrome…for the Triple Crown!!! I think that covers everything!!! Jeepies! I hope I get 2 outta 3!!! Congrats to Josh and Meryl and Max! I’m two out of three on the year, but that’s ok cause I’m probably getting too mainstream if my favorite ever won. I liked Josh and felt pretty sure that he would win but considering the system the Voice uses to get down to the finalist there is no future in falling in love with any of them. There were several others that I liked that fell out along the way. It was an interesting dynamic to have a self created young female pop singing You Tube sensation in the finals of both the Voice and American Idol. Jake was hilarious last night, “come on.” I can’ imagine how he made it to the top three though. Likeability plus Blake and a fair voice I guess. I’m glad that DWTS sorted out like it did. Maks and Meryl had a great season together and Derek and Amy were incredible in their own right. Candice had a good run as well and was a pleasure to watch as a contestant even though I believe she was beaten by James, Danika and Charley. Any of them could have won in a typical season.